Timothy Bradley as the 2012 WBO WELTERWEIGHT CHAMPION. Timothy Bradley said to have defeated Manny Pacquiao in a 12-round boxing match last June 9, 2012 in MGM Grand Arena in Nevada, USA. If you had watch the fight, it is noticeable that Manny Pacquiao seemed to dominate the fight against Timothy Bradley from the opening round until the middle round. While there were a few (3-4) rounds that seemed like that could be scored for Bradley, it seemed impossible by the time the final bell had sounded that Timothy Bradley had done nearly enough to take a decision but unfortunately that's exactly what happened. 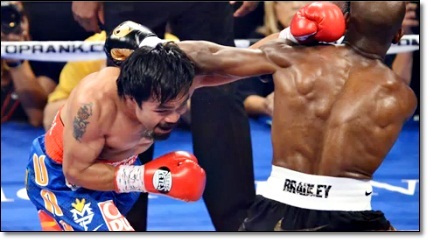 Manny Pacquiao's hard straight left landed on Bradley's face almost all night long from the early to middle rounds. Manny's powerful blows were certainly more telling than Bradley's much lighter shots. Beyond the quality and power of the shots landed, Pacquiao dominated in terms of actual punches landed and accuracy. Manny Pacquiao landed better, bigger, monster punches that rocked Timothy Bradley. See Video! Manny Pacquiao landed 253 out of 751 thrown whereas Bradley landed only 159 out of 839 thrown. This is clearly the worst decision ever that the Nevada Athletic Commission had made. Keith Kizer, executive director of the Nevada Athletic Commission should overturn the judges decision and suspend the two judges who declared Bradley as the winner. Mark November 10, 2012 on your calendar that will be the date of the rematch between Manny Pacquiao vs.Timothy Bradley.